I Prefer Reading is moving to Wordpress. The new link is here. I've been thinking about a move for a while as I feel the blog needs freshening up. I've been able to import all my posts from this blog & I'm finding my way around Wordpress at the moment so hopefully it won't be too long before I start posting there. I was also inspired by Pam at Travellin' Penguin & for much the same reasons - dissatisfaction with Blogger - odd stats, the disappearance of my blog roll & favourite sites etc. I'm not sure what Lucky & Phoebe think about the move but as long as they're comfortable, fed & attended to, I don't think they'll care one little bit! With Armistice Day only a few days away, I've been reading my favourite war poets. 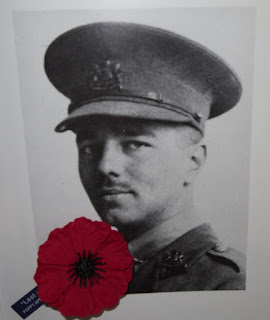 This is a less familiar poem by Wilfred Owen with the poignant title The Next War. Unfortunately there's always a next war. "The war to end all wars" was a phrase that was nonsense almost as soon as it was coined. While we know such dreams are true. A cure for obesity is the Holy Grail of medical research. Two years after a drug trial that went horribly wrong when a participant died, Calliope Biotech is close to success in the quest for a drug that will cure obesity. When another company claims to have got there first, & takes their claim to court, patent lawyer Daniel Marchmont is employed by Calliope's entrepreneurial director, Lyle Linstrum, to scrutinize the evidence of lab books & trials when the lawyer working on the case, Jennifer Blunt, is killed in a car accident. Daniel's reservations about taking on the enormous workload of the case are complicated by the fact that Jennifer was his ex-wife, who had left him for his best friend. Now happily married to Rachel, they have a daughter, Chloe, who suffers from Diamond-Blackfan anaemia. Rachel is concerned that taking on Jennifer's case in such circumstances will revive painful memories but she's unprepared for the stress that events from the past will place on her marriage. When Daniel discovers that a vital lab book, detailing the experiments undertaken by Honor Masterman & her team, is missing, & questions are raised about Jennifer's professional competence, the car accident begins to look more sinister. When Daniel finds the missing lab book hidden in Jennifer's house, the mystery only deepens as he tries to discover why Jennifer hid the book & what impact its contents will have on the case. Chloe's condition needs constant treatment - blood transfusions, injections - & the only hope for a cure is either a bone marrow transplant (neither Daniel or Rachel is a match) or the research that consultant paediatrician Paul O'Sullivan & his team are working on. Grant money is fast running out & researcher Katie Flanagan is under pressure to come up with publishable results that will hopefully lead to a cure for Diamond-Blackfan anaemia. Rachel is involved with the charity sponsoring the research &, after meeting her, Katie is very aware of the lives that depend on her work. That's why she's frustrated when her experiments don't seem to be producing the expected results. Katie is also aware of how important this research is for her own career. She can't stagnate at her current level forever. She needs to move on from postdoctoral research in a lab to a lectureship or permanent university post. After the sudden death of her supervisor, she was lucky to be offered a bench in Honor Masterman's lab to be able to complete her research before the grant money ran out. Professor Honor Masterman has been touted as a future Nobel Laureate & her team, led by Will Orville, are depending on the successful outcome of the patent case; their reputations depend on it. Katie is grateful for a working space but soon becomes aware that there's something wrong at the lab. Working late at night she's aware that there's someone else there, someone who isn't written in the log book. There are also odd accidents - chemicals misplaced, the spread of radioactive contamination. There's also the puzzling non-results of Katie's experiments. A gas explosion that leaves a security guard & lab technician Ian Gladwill in hospital leaves Katie wondering if someone could be deliberately sabotaging the lab. Katie's friendship with Rachel leads to her renting the Marchmont's barge when her flat's lease runs out. She becomes involved in Daniel's case when she's able to help him interpret the crucial lab book & begins investigating, putting herself in considerable danger as reputations & a lot of money are at stake. Deep Water is a terrific thriller. I enjoyed it as much as Christine Poulson's last novel, Invisible. I really enjoy the way that she combines a tense plot with the very personal stories of her protagonists. Daniel & Rachel's desperate search for a cure for Chloe that leads Rachel to join the board of the charity raising money for research is underpinned by the details of Chloe's ongoing treatment. Their life revolves around Chloe's needs but they're a happy couple until Jennifer's ghost brings back Daniel's memories of their marriage & heightens Rachel's insecurities about her place as Daniel's second wife - was she only second-best? Daniel's reservations about taking on Jennifer's case are complicated not just by personal feelings but the need for his company to keep Lyle Linstrum happy. He can have no idea of the complications that the case will bring to him personally as well as professionally. I also loved all the detail about scientific research & the constant need to publish, chase grants & funding, the temptation to heighten or even falsify results is ever-present. The atmosphere of the lab, with its strict security & focused researchers, was great but I always love the sense of place that Christine Poulson evokes. The Cambridgeshire Fens, Ely Cathedral & especially the lonely stretch of water where the barge is moored, were so evocative. As a cat lover I also have to mention Orlando, the ginger cat who has several significant scenes in the narrative. Katie Flanagan is a very sympathetic character & I'm pleased that Deep Water is the first in a series featuring Katie. The moral & ethical dilemmas in the story are incredibly knotty & all the characters have to grapple with the human cost of their actions. I always read Christine's books in a great rush & this was no exception. 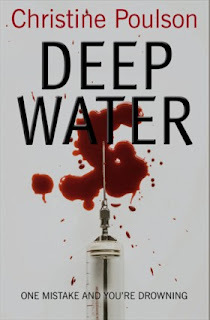 Lion Fiction kindly sent me a review copy of Deep Water. You can read more about Christine's work at her website here & there are interviews with Christine on Sue Hepworth's blog & at Clothes in Books.